NSFL battle-wounds or poetic meditations on the body? Ever felt like your coffee table art was a little bit tame, slightly obvious, a bit Guardian? What you need is a grittier addition, something a little more x-rated, something to set your coffee table apart. Bob Walden: Negligence Photography is the book that just might give your collection that edge, but unfortunately it's still in the Kickstarter stages. For over 20 years, Bob Walden has worked as a freelance legal photographer throughout the New York City area. By the time he retired in 2012, he had worked on nearly 10,000 cases, most of them plaintiff’s negligence cases. Some of the scars, injuries and deformities he has captured would make the most stoic of eyes water but fellow photographers Collin LaFleche and Bonnie Briant are lifting the images out of their legal context so that they become "poetic meditations on the body and the body transformed." The pair are working with Walden to create a book of his most compelling images, one not for the faint of heart but one that will certainly spice up your coffee table. We spoke to Collin about why this series is all about survival not victimisation and why the prettiest image aren't always the truth. How did you hear about Bob Walden’s collection? Collin LaFleche: We discovered it through his son, Jesse, a friend of ours. A long time ago he told us about the images, and his father’s massive archive of material. As soon as we had a chance to see the work, we knew we wanted to do something with it, to bring it to a wider audience. It’s something Jesse has been interested in doing for a long time, but I think having two outsiders come in and show enthusiasm made Bob more energized to let us explore the work. What inspired you and Bonnie to make the book? Collin LaFleche: We both believe strongly in the power of the book to give new life to this body of work. A photography book is not the same thing as an edit, or an exhibition, or an online gallery. Each has different concerns. And a really successful book can often be more satisfying than a series of prints hung on a wall. So we wanted to take Bob’s images, which are so compelling and different from a lot of other photography out there, and make a book that felt different from most others that we see — to take a common form and fill it with something uncommon. You say it’s going to be a beautiful book but a lot of the images are very graphic and potentially upsetting. How will binding these images together create something of beauty? Collin LaFleche: By looking at the edit as a cohesive whole and not as a series of individual images. It’s a little cliché, but a good book edit is like a piece of music or a landscape — there are peaks and valleys. That variation and progression is what brings the most unsettling images into a more nuanced setting. And the book will let the reader control their experience, their progression through the work. The contrast between the object and its contents brings up an interesting comparison of the book as a body, and the images as its imperfections. That’s cheesy, but apt in some ways. The beauty of the book will come from the nuances it contains — if we only selected the 'pretty' images, there’d be no truth to the experience, and nothing to keep you interested. Do you worry that people might see the images as perverse? 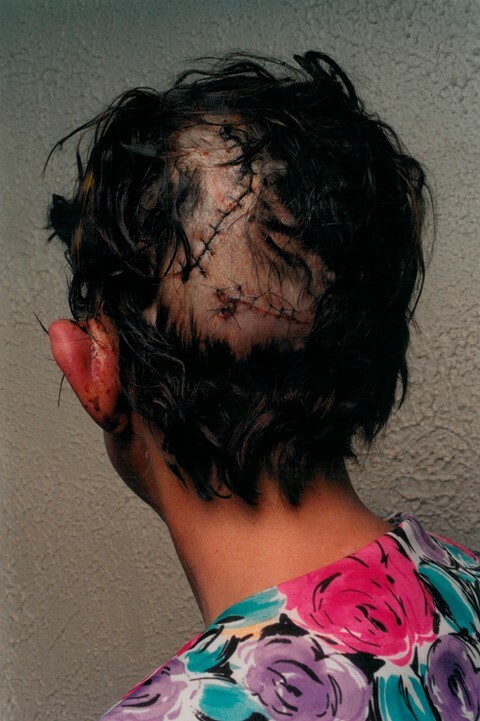 Collin LaFleche: Many of the photographs are decidedly very graphic but t’s a careful balance. It would be easy to make the book very graphic and melodramatic and loud, a single note of in-your-face images. We don’t want to do that. Those images don’t constitute the entire story, but they are part of the story and need to be included. It’s important that they be seen. Taking a step back, some of the most difficult images can become very abstract and poetic – the body takes on such otherworldly forms that it’s impossible not to look. There’s an innate curiosity there (which is part of photography in general) that we think is important to explore. You can pledge to help fund the publishing of Bob Walden: Negligence Photography here.